Pop art is an art movement that emerged in the mid-1950s in Britain and the late 1950s in the United States. Pop art most often uses elements of mass culture, such as advertisements, celebrities, comic books, or mundane objects like food as its subject matter. 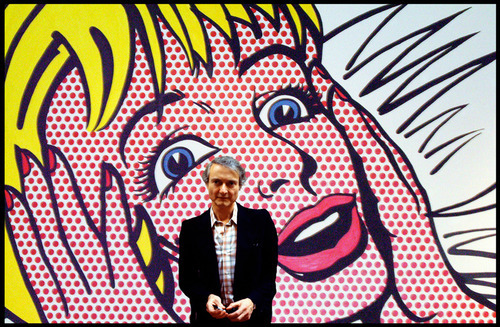 For this project, we will be looking specifically at pop artist, Roy Lichtenstein and his comic-strip inspired style. Using a candy wrapper (Save your Halloween candy wrappers!) we will draw a large scale, cropped composition, looking through a viewfinder at the candy wrapper. Then we will use marker to fill in the color with LOTS of dots. We will finalize our drawings with a thick black outline.